Remember Spamusement? When it was still current, it featured quick pen drawings based on spam subject lines. It was hit and miss but mostly hit; however, it dried up in June 2007. 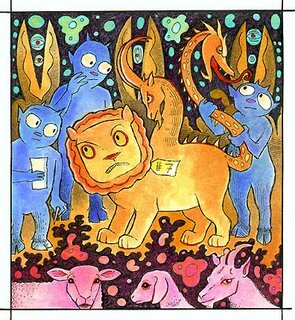 But today Neatorama linked to Kipling West’s Fresh Spam blog, in which she puts considerably more effort than Spamusement did into illustrating spam, switching styles as often as the Perry Bible Fellowship and often choosing intricacy over the quick, like in Cloven Chimera Buyers below — although she’s not afraid of a straightforward take either. I enjoyed Spamusement’s approach but I really like what West’s doing. I love this kind of hand lettering, although I’m not sure if using spam subjects makes it better or worse. Anyone know of more (non-spam) hand-lettering blogs or Flickr users showing off their handiwork?